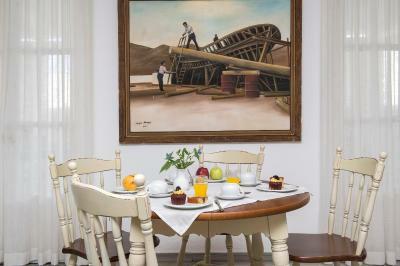 Lock in a great price for Hotel Aegeon – rated 8.5 by recent guests! Breakfast spread was wonderful and staff very helpful! Place was very convenient to everything! The staffs have been really helpful, kind and nice people. There is a narrow street next to the hotel that you can go to the beach in 7,8 minutes. And in 10,12 minuets you'll arrive to the port. Pick up service to the port and ms. Despina and Eptimios kindless and disponibility. 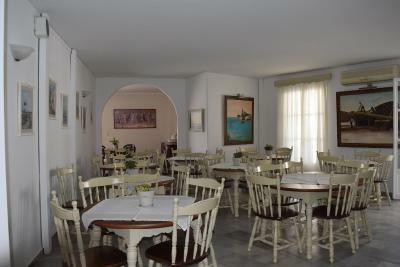 Good standard of hotel, great breakfast, nice interior, good sized room and 5 minutes walk from the beach. Nice big breakfasts, pool(albeit small). Obliging and 24 hour reception. Staff pleasant. Quite near port (10 min walk). Nice restaurant opp. This hotel was great highly recommend. Pool was lovely, staff were so nice and the free breakfast was perfect. 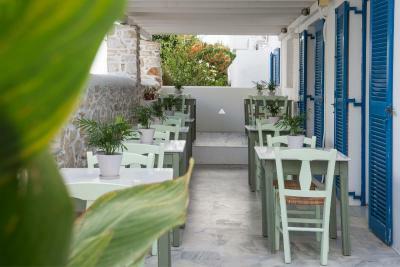 It’s a great bakery up the road and a fantastic grill house restaurant opposite the hotel. 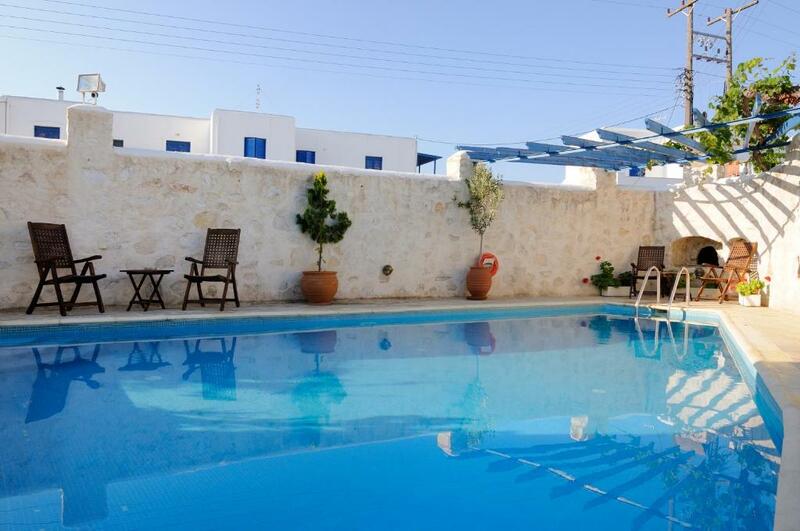 Hotel Aegeon This rating is a reflection of how the property compares to the industry standard when it comes to price, facilities and services available. It's based on a self-evaluation by the property. Use this rating to help choose your stay! 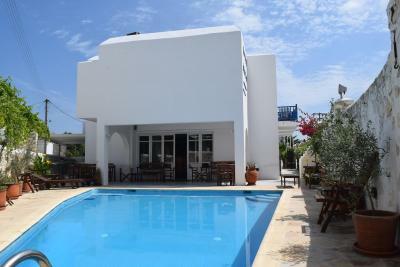 Featuring a pool with sun terrace and a snack bar, the Cycladic-style Aegeon is conveniently located in the lively Parikia, just a 10 minutes’ walk from the beach and port. 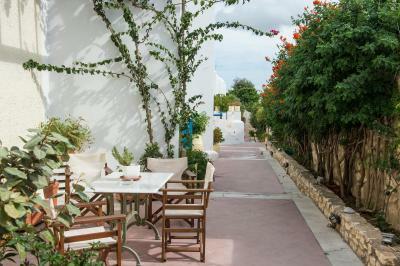 It offers free Wi-Fi in its public areas and air-conditioned rooms with a balcony or patio. 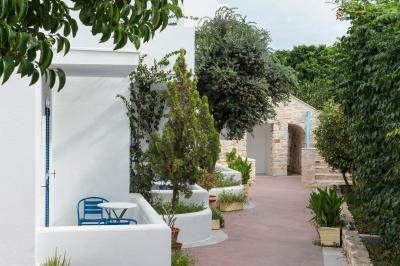 Overlooking the garden or the surrounding area, the simply decorated rooms of Aegeon have a fridge and a TV with satellite channels. Each unit includes a private bathroom with a hairdryer. 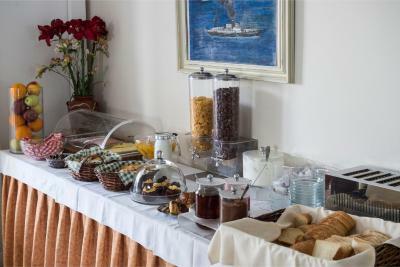 A buffet breakfast is served daily in the traditionally decorated dining area or at the sun terrace. 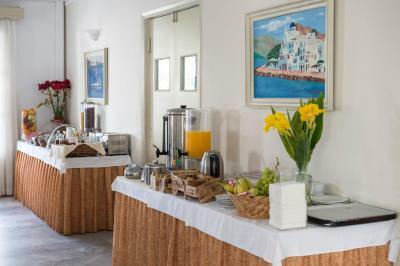 Drinks, coffees and light meals can also be enjoyed at the snack bar throughout the day. Restaurants and bars are within a short walk. 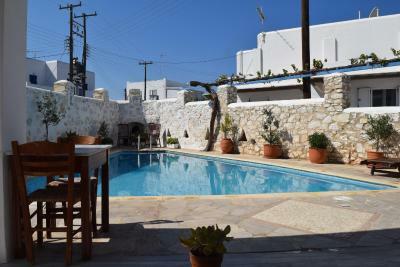 Aegeon is located 6.2 mi from Paros National Airport and 6.2 mi from Naousa Village. 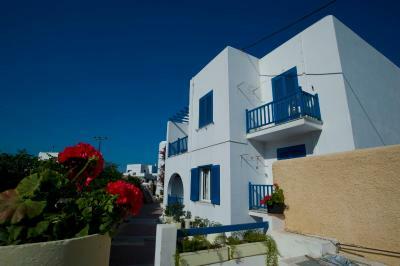 Staff at the front desk can arrange car rental to explore famous beaches, such as Kolympithres at 6.8 mi. Free parking is possible on site. When would you like to stay at Hotel Aegeon? Opening out to a balcony or a patio, this spacious room comes with air conditioning, TV and fridge. The private bathroom is stocked with a hairdryer and free toiletries. 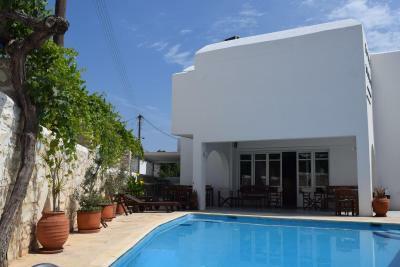 Opening out to a furnished balcony overlooking the garden, this spacious room comes with air conditioning, TV and fridge. The private bathroom is stocked with a hairdryer and free toiletries. 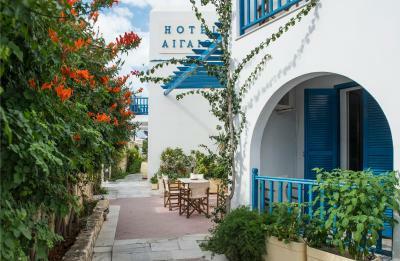 Hotel Aegeon on Paros Island, Greece offers clean and comfortable accommodation ideally located in the heart of Parikia town.The Hotel Aegeon offers centrally located lodging all just a few minutes walk from the old town and the shops, stores, cafes and restaurants of Parikia and the seafront. 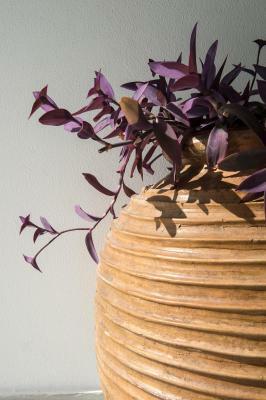 For over 30 years, the Hotel Aegeon has been pleased to offer Paros hospitality to visitors from around the world. House Rules Hotel Aegeon takes special requests – add in the next step! Hotel Aegeon accepts these cards and reserves the right to temporarily hold an amount prior to arrival. Free transfer for guests is offered upon arrival and departure to/from the port. Please inform Aegeon 3 days before arrival if you want to use the service. As the hotel is located on the main road, there was a considerable amount of traffic noise, especially noisy motorbikes. There was no shower wall bracket. Management was most pleasant & helpful and made arrangements to accommodate us for two additional nights at very short notice when the ferries were stopped due to bad weather. Breakfast was included. My room was at the front and there was a lot of noise from the busy road. Noise coming from the peripheral street. Everything was fine. Location was not too close to port but was picked up by them and dropped back off at port next day, so that was very useful. The staff were lovely and the room was everything we expected and more. It was very very noisy, even though we were at the back of the hotel where it was "quieter ". Double bed was very small. No safe in the room.Wifi signal did not work. 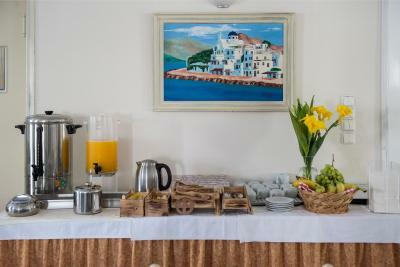 Breakfast was not great in comparison to other hotels we've been staying at on our Greece trip. Flies constantly surrounding and landing on the food at breakfast. Continental breakfast with ample food. Hotel was very clean and well run. 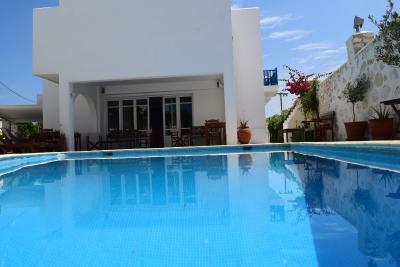 Lovely outdoor swimming pool with loungers and comfortable seating area. Staff were very friendly and welcoming.